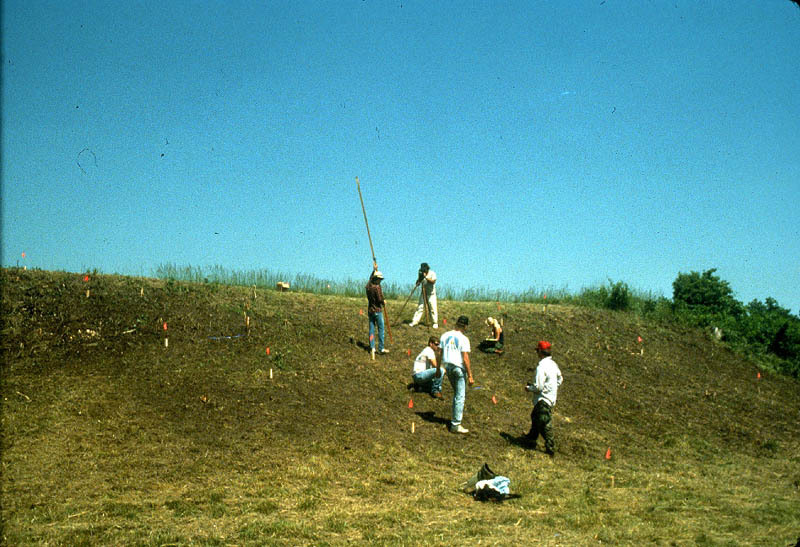 Recent archaeological research at Towosaghy (23MI2) was directed in 1989 by Professor James E. Price of the University of Missouri - Columbia and Greg Fox of the Archaeological Survey of Missouri. Another name for the site is Beckwith's Fort. Towosaghy was a palisaded town with a large central mound, smaller mounds, and a plaza. Radiocarbon dates span from AD 960 +/- 185 through AD 1275+/-70. 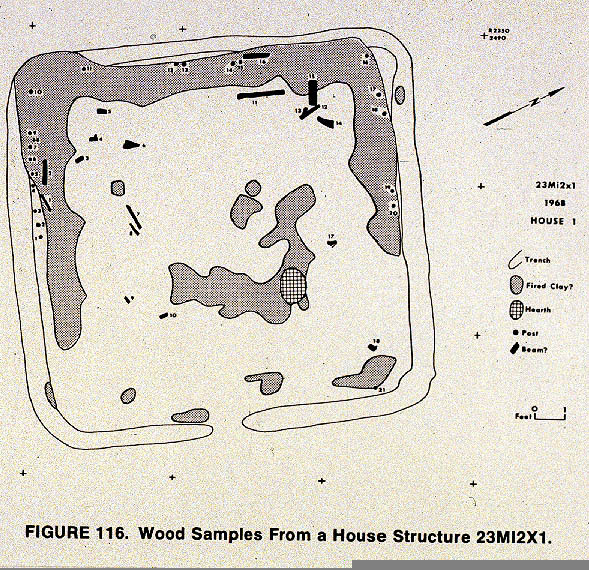 The site is discussed in detail in Archaeology Missouri, Vol. 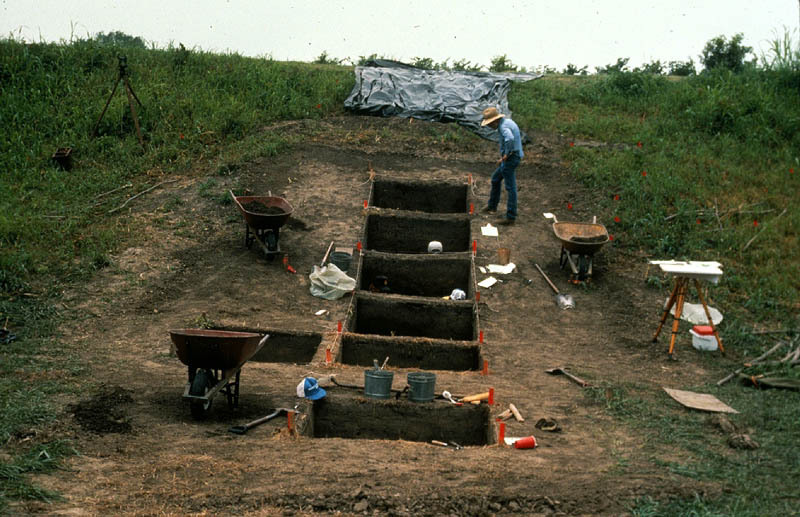 2 by Chapman (1980), volume 38 of the Missouri Archaeologist (1977) and The Prehistory of Missouri by Michael J. O'Brien and W. Raymond Wood (1998). 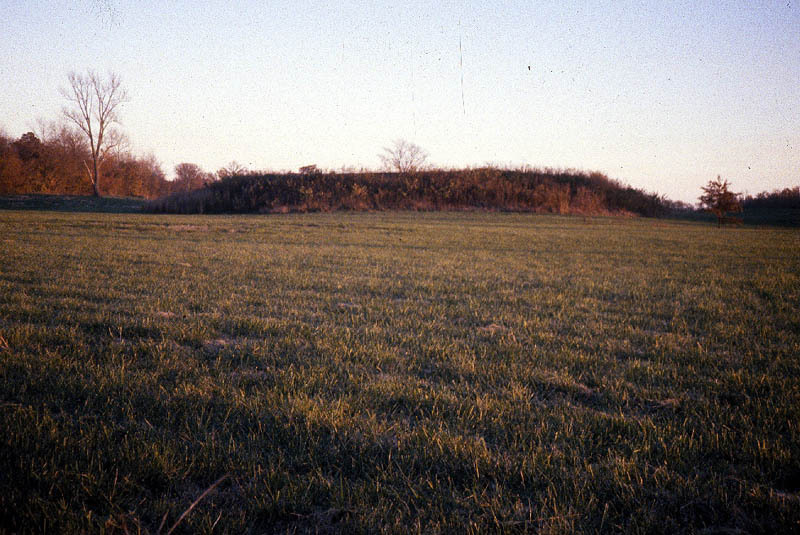 Main Temple Mound (mound A) at Towosaghy (23MI2). Surveying a step trench down the slope of mound A at Towosaghy. 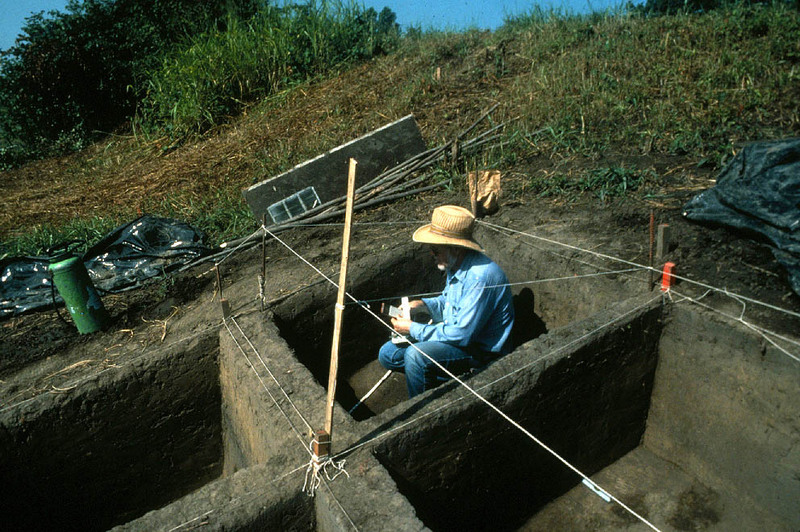 Professor Jim Price and the step trench along the slope of mound A at Towosaghy. Professor Jim Price recording stratigraphy in the step trench along the slope of mound A at Towosaghy. Pottery sherds and charcoal from a burning/cleaning episode in the history of mound A at Towosaghy. 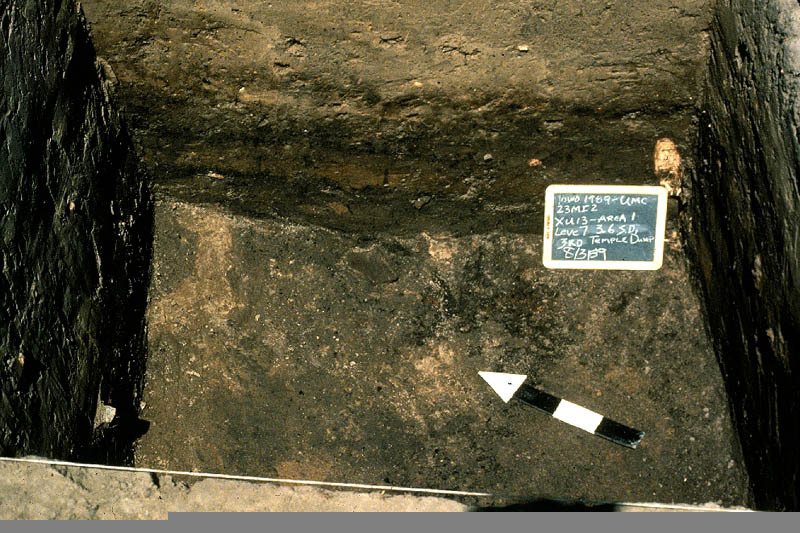 The fill, possibly as late as the AD 1400 to 1500 contained fragments of a negative painted bottle, fluorite and quartz crystals, mica, a red painted elbow pipe, earplugs, an ear spool, jar fragments caked with paint on the inside, lumps of kaolin clay, and plate sherds" (O'Brien and Wood 1998:322). 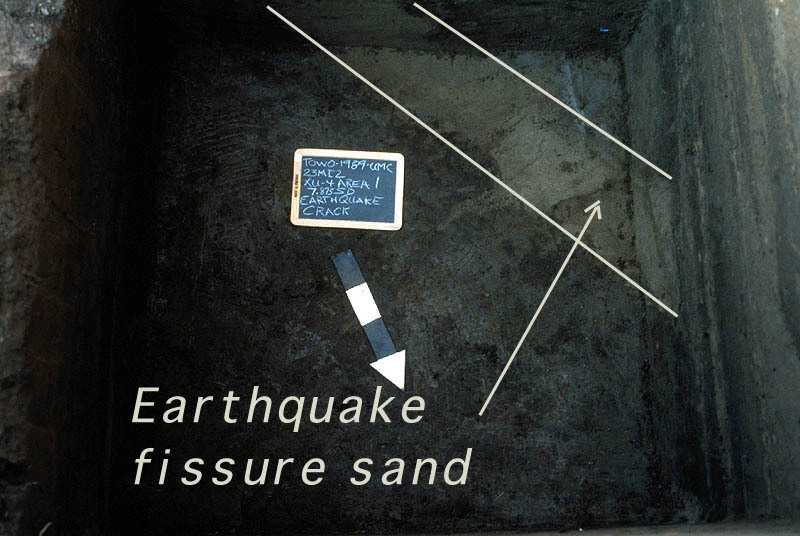 A sand filled fissure at Towosaghy is evidence of seismic activity along the New Madrid fault during or after the construction of the mound. Plan of a wall trench house excavated in 1968 at Towosaghy and published by John Cottier and Michael Southard in the Missouri Archaeologist Vol. 38, 1977. 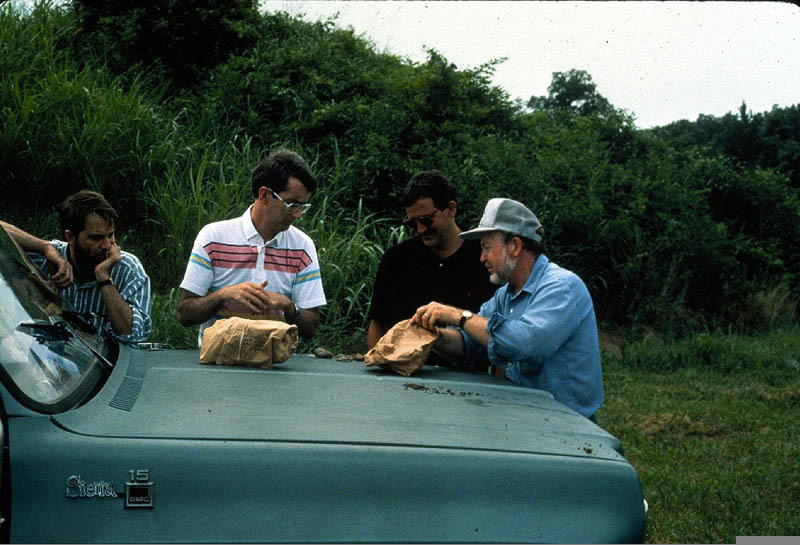 Professor Jim Price (far right) sorts a debris bag for discussion with Dr. Bruce Smith (Smithsonian) and Professor Michael O'Brien (University of Missouri - Columbia).